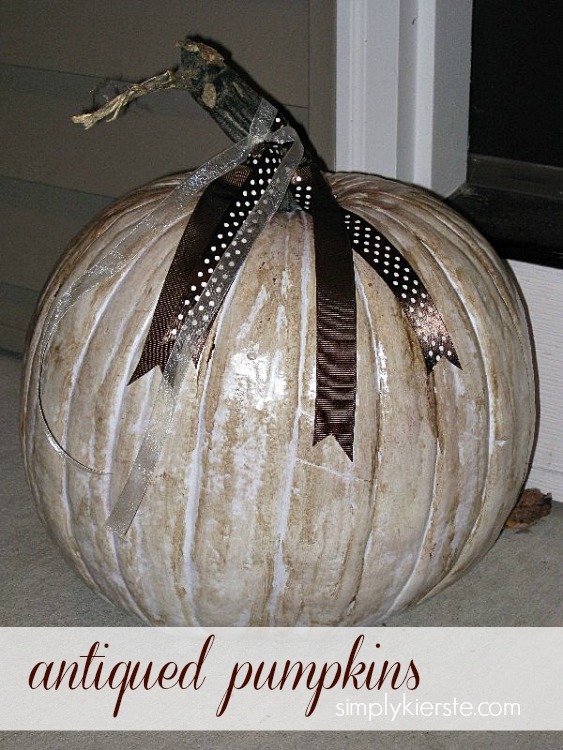 I wanted to do something different for my front-porch pumpkins this year, so I combined my love of white pumpkins with my love of all things antiqued to create Antiqued Pumpkins! I took out my trusty Rustoleum white spray paint, favorite stain (Minwax…Provincial), and of course, some ribbon. I love when I can finish projects with things I have around the house! It was a really easy project, and I just love the finished result! -Tape off the stem with painters tape. -Spray pumpkin with paint, let dry. -Using the cloth, carefully cover the pumpkin with the stain. Don’t rub too hard—the paint will come off easily. If some comes off, that’s okay–it adds to the distressed look. You just don’t want too much coming off. Let dry. If it’s really hot where you live, you may consider using fake/foam pumpkins instead of real ones–they’ll last the whole season!